Casinos and gaming operators around the world are talking about the future of sports betting in the United States. In New Jersey, ground zero in the battle over betting legality, venues are now scrambling to prepare for a future that includes both on-site and online sports books. While most of the talk always centers on Atlantic City, an obscurely located racetrack has been blazing trails for the last several years and is now looking to cash in on years of preparation. In 2013, when legal online gambling was still “coming soon” and Christie v. NCAA was years away from reaching the Supreme Court, Monmouth Park Racetrack was already staking out a prime position for success, aiming to be the first modern, licensed, full service US sports book outside of Nevada. Monmouth inked a partnership with British gambling giant William Hill, one of Europe’s premier betting companies. The partnership put it on track to drastically expand its operation, along with the track’s symbolic importance to the world wide gambling industry. In 2014, NJ Governor Chris Christie signed a law that legalized sports betting in the Garden State, contingent on wagers being regulated by a non-state actor. An industry group known as The Independent Sports Wagering Association (TISWA) was formed to regulate operators, and Monmouth Park prepared to begin taking bets soon after. Court battles have slowed their progress, however, with the final verdict to be handed down by the US Supreme Court in the coming months. And all the while, the planning and building have continued. 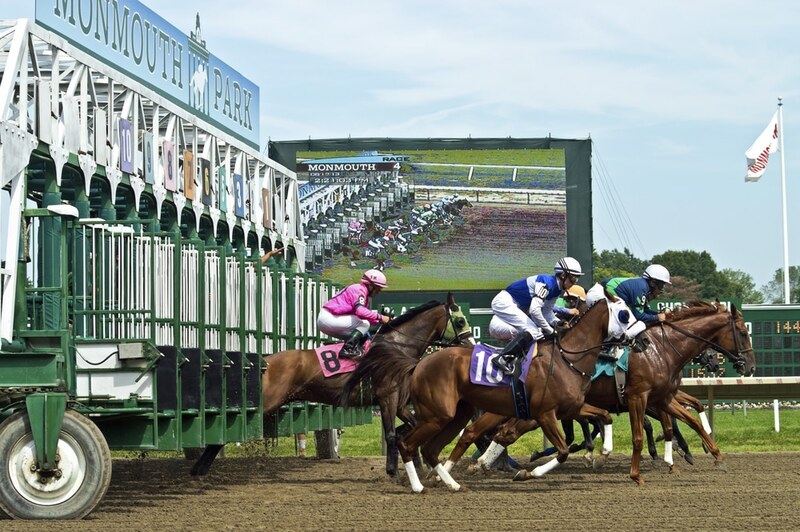 The area intended to become the Monmouth Park sportsbook has had to be a bit less than planned so far, while waiting for court battles to play out. According to Chairman and CEO Dennis Drazin, the venue began offering free play in year one and fantasy sports in year two, finally converting the space to a full blown sports bar in 2017. The bar has become popular, particularly around the weekends and when major sporting events are happening. So far more than $1 million has been invested in the space, but that sum is paltry compared to what they’ll be investing soon. Plans include expansion of the betting facilities out into the grandstand area, in order to have betting available both in the bar and in the grandstand by the time it becomes legal in the state. Once betting is officially legal, plans go even further. William Hill will be spending at least $5 million to build out additional space, according to Drazin, and the plan is ultimately to have a Las Vegas style sports book, with all the frills. This part of the expansion will take place in or around The Lady’s Secret Cafe. There will likely be further areas developed within the facility, and Monmouth Park and William Hill are planning to take online bets as soon as it’s allowed in the state. Everyone involved acknowledges the inherent risk in assuming the Supreme Court will repeal the Professional and Amateur Sports Protection Act (PASPA) in its entirety. This is the preferred outcome for most of the industry, as it would allow states around the country to regulate sports betting similar to the way they regulate other forms of gambling. Right now, only Nevada has a full set of options, with the rest of the states locked out of taking single game wagers. PASPA could easily be upheld, and if so it will put a damper on many states’ plans to move forward with legalized betting. But there are more potential outcomes than just a repeal or upholding of PASPA. One of the most talked about scenarios is one that has been referred to as a partial repeal, or narrow repeal. If this is the decision, the Supreme Court would effectively be saying that PASPA is still a valid federal law, but that New Jersey can go ahead with its 2014 law that allows for private regulation of sports betting. If it plays out this way, Monmouth Park should be able to quickly offer sports betting, well in advance of the 2018 NFL season. The bets would be regulated by TISWA, which would have a private board, executive director and a system of rules and regulations to protect the public and oversee the industry, including a platform to review consumer grievances. It would be a highly experimental regulatory environment, and one that would certainly cause further federal review of the approach to this highly popular but mostly prohibited vertical. In the case that PASPA is repealed entirely, there will almost certainly be a period of at least a few months in which the state establishes regulations and license applications are processed. During this time, as was the case with online gambling for most of 2013, the opening of licensed sports betting venues will likely be on hold. According to Drazin, however, Monmouth Park would be able to start taking bets quickly under this scenario as well, possibly within 2 weeks of the SCOTUS decision, being regulated by TISWA in the short term but eventually by the state. Whether or not this scenario actually plays out this way is anyone’s guess right now, but you have to admire the ambition. One way or another, Monmouth Park is going to be a major player in sports wagering in the Garden State.